In addition to ranking the Top 18 Courses I have played, I have taken the chance to isolate my 18 favorite golf holes by Par. Also, please also see my rankings of the best holes by number order, which I've dubbed the "Dream 18" and the "Second 18" or go to the Golf Course Guide for a full description of any course that graced this list with one of its best designed holes. This page of par threes represents those "single-shotters" that have captured my imagination better than all the rest. There are many other holes that are famous or amazing that didn't make this list, but beauty is in the eye of the beholder. I imagine many other golfers will indeed agree with SOME of my choices here, just as many of my choices agree with a few other published lists I've seen. All I can say as all of the following holes represent the most unique, challenging and beautiful par threes I've seen: in other words, they are the best. That being said, drilling down further and trying to rank these 1-18 is too difficult even for me, so I have broken them into larger sections called the "Front Nine", which has the absolute cream of the crop and the "Back Nine" which may fluctuate more from time to time as more great golf holes are encountered. Within each of these sub-sections, the best golf holes are in alphabetical order by golf course. Comments: Pretty much every serious golfer knows this hole as it is one of the most photographed in the entire world. What most don't know is that from the back exhibition tees, it is 272 yards and requires (with no wind) about a 230 carry over the ocean just to reach the front bunker (the "normal" back tees are still 200+ yards). Also, the green has three distinct areas separated by tiers, making the hole even more difficult as merely avoiding the Pacific won't save the golfer from a frustrating three putt. Clearly one of the world's elite holes, this one is worth the price of admission (plane flight and all). Comments: This hole is why cameras should be taken on golf courses, and it makes many framed cameos on office walls all over the world. 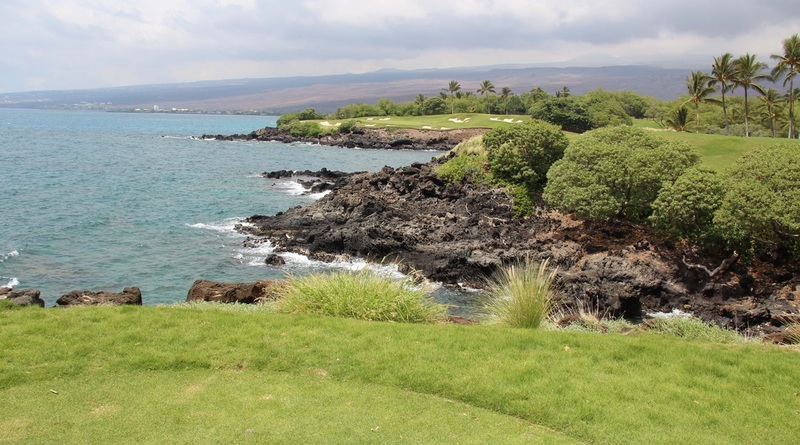 Not many holes can offer shots clear over a beautiful lava-ringed cove of the Pacific Ocean, to a green ringed by bunkers and palm trees, but this one can. It is not oppressively long or difficult on paper, but the nerves of the player can play a big part on this shot. Comments: At less than 150 yards from all tees, one might be tempted to overlook the difficulty of this little beauty, but peril is everywhere. 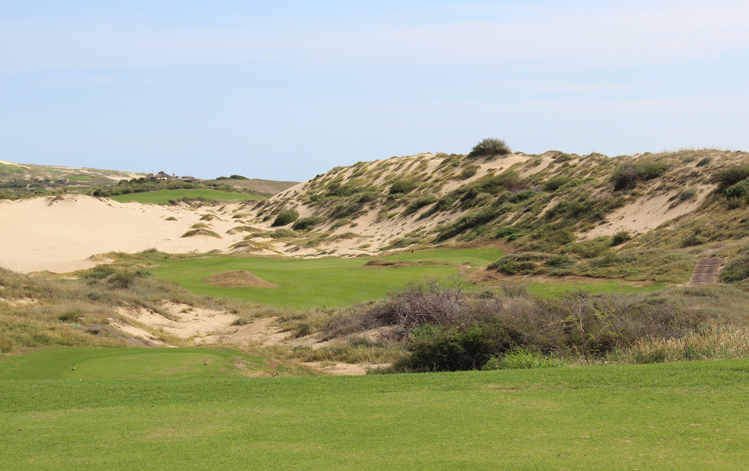 From the obvious cliffs to the left and high dunes right, any lateral miss will almost guarantee bogey or worse. However, the tiny green also requires perfect distance control to avoid long grasses both short and long. Simply putt, just don't miss, but enjoy the views. Comments: There are a lot of beloved island par threes, and two of the most famous are courtesy of Pete Dye. My favorite is the island known as Alcatraz at the Stadium course at PGA West in La Quinta. The green is a fair size, without being comfortably large. Additionally, the tee shot is a little elevated, allowing for a little more visual suspense than other island holes and it comes equipped with a nice mountain backdrop. Finally, surrounding the green with rocks is great as shots hit on the edge will careen this way and that, sometimes saving the golfer, and sometimes destroying them. Comments: If there is one hole on my favorites list that absolutely owns me, it is this one. I've played "Gorge” four times to date and found a way to screw it up in every direction, except for the one time I hit it to 3 feet...and then missed the putt, which still felt bad. Simply put, this is a fantastic par three and if the golfer misses anywhere, the ball is gone or in a deep unforgiving bunker. This is no easy task as the tee is also elevated and the trade winds usually have plenty of time to mess with the tee shot. The green is also shallow and heavily sloped, so the fun isn’t over till the ball is in the hole. 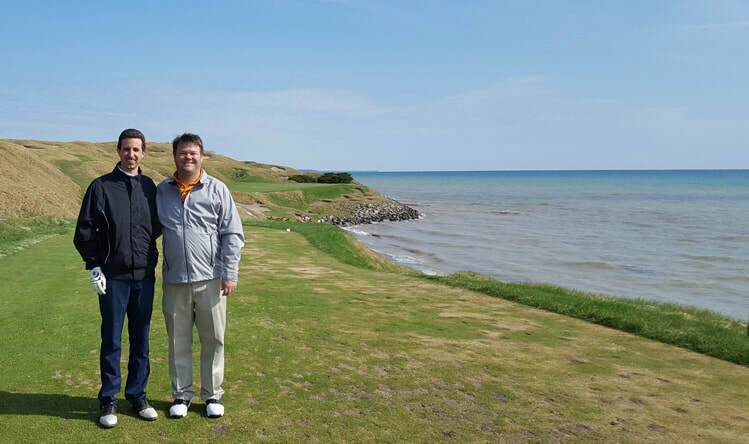 Comments: I had the honor and extremely rare fortune of playing this hole in May with little wind and blue skies. With the gorse in full bloom, from the elevated tee, the view to the green is frightening for the shot, but exhilarating for the experience. With most of the course in view, the mountains of Mourne, the sea and the town of Newcastle in the background, the player must negotiate the forest of gorse between the tee and the green, taking care not to go right or long as well, as either of those mistakes is very bad. Comments: Arguably the most notable par three in the world, the island green seems so small from the tee, the golfer can’t help but feel a little squeamish at the fate that awaits the less than perfect shot. I simply must say the hype of this hole is not overestimated as it is a great one. Comments: A truly unique par three, this one has tee boxes on the rocky edge of the Sea of Cortez and the player shoots a wedge or short iron over a wide sandy beach to a multi-level green. the surface is surrounded by rocks and long-grass covered hills that give the hole a mesmerizing links feel to it, which is contrasted by the cactus-filled desert / ocean landscape of the tee box, filling the senses with three types of golf on one shot. The three bunkers also make distance control paramount on this one-of-a-kind hole. Comments: The signature hole at this course is a fun test of golf and provides the first water hazard of the round: the Pacific Ocean. It’s all carry to the green and anything short or left will tumble down the steep cliffs to the water below. The views are awesome and the green is tough to putt as well. Comments: The signature hole at Greywolf is one of the most fantastically beautiful and scary par threes in the world. Named “Cliffhanger”, the only bailout option is right, and there isn’t too much room over there unless the shot still has the correct distance. Anything missing elsewhere won’t be found, at least without a back-country guide. Comments: This is a great and beautiful hole with a long carry over an enormous and deep mango forest (the player gets to drive the cart down and through in an uniquely Hawaiian experience, which sets it apart from many holes that involve shots over hazards, but drives around, not through, them). Anything short will fall to its doom or be mired in one of two huge bunkers that also wrap around the left side of the green. There is a bail out area right, but it’s still a long carry over the jungle and third bunker lurking there. The backdrop of the Kauai mountain ranges and native flora make this hole as beautiful as it is tough. Comments: This par three is built near the low point of the golf course property, above the quarry lake and below the sheer white face of the remaining rock face. It is pretty in an unusual way and very daunting. Although it is downhill, the distance is still 214 yards, requiring a longer iron. There is no room left and very little short, but there is some respite to the right. The ball will hang in the air for awhile so the player will get time to despair or be elated by what unfolds. Comments: This is an incredibly difficult par 3. The tee shot is played over a jungle barranca with the trade winds usually blowing directly in the players face. There are bunkers left, behind and right of the green, which might actually save a player from going in the jungle that surrounds the hole. Don't forget the ocean views, which are plentiful from tee to green. 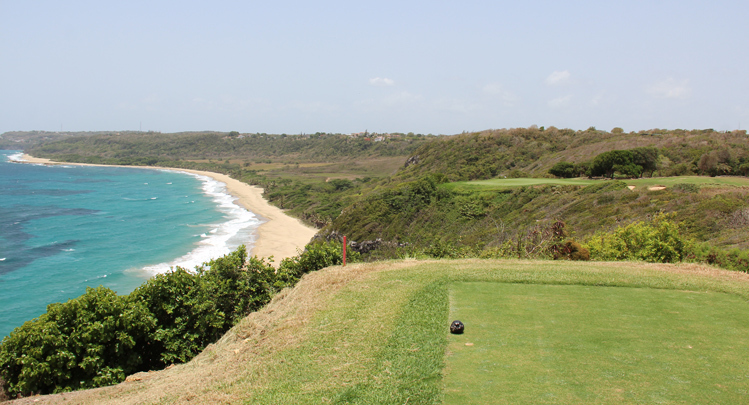 Comments: One of the most idealistic tee boxes on earth affords incredible vistas of beach, jungle, reef and coastline. However, for the golfer, there is also despair to know that there is no bailout left, long or short of this green. The only safe haven for a miss is right of the green and, thanks to a local rule, one gets a free drop out of the trees just right and behind the green. Of course, there is also a very large curved tier that separates the front left third of the green from the rest of it. So, even if one hits the green, they can still have a tough series of putts to be able to claim par or better on this breathtaking par three. Comments: Dazzling on a sunny day and formidable in any conditions, the third is a par three gem. Pins cut right of center are particularly troubling, but don't miss right or long for sure. 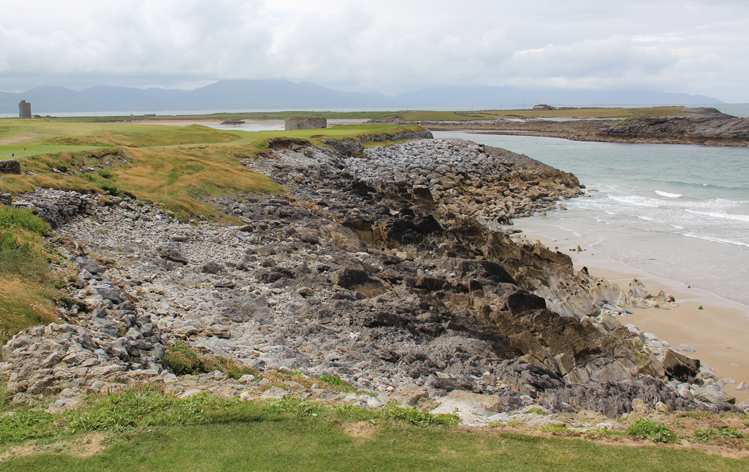 The rugged coastline, complete with old castle ruins make for a truly memorable hole. Comments: This par three may give the most realistic chance of actually finding the WATERS of Lake Michigan on Whistling Straits, and the hole is not short, requiring, for most golfers, a mid iron at a minimum. The entirety of the green is not more than 20 yards from that hazard. Going left of that will result in, almost certainly, a downhill chip of mounding or a sand shot towards the lake, which is beautiful, but treacherous. Check out the other GolfTop18 lists.